Coachella festival is out and loud with the first of the 2 weekend fun time being history. It’s the second most popular annual music festival in America after Summerfest. 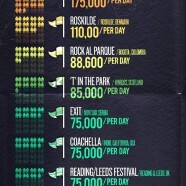 Let’s see 10 more of the largest music festivals around the world ranked by overall attendance.